Jos Buttler hit the fastest Twenty20 international half-century by an England batsman to propel the home side to a 28-run win over Australia. Buttler, promoted to open, reached 50 from 22 balls at Edgbaston. He ended with 61 and, along with 49 from Alex Hales and Jason Roy’s 44, helped England to 221-5, their second-highest T20 total. Though Aaron Finch hammered 84 from 41 balls, Australia were bowled out for 193, with Adil Rashid claiming 3-27. It completes a miserable tour for Australia, their first trip to England since the ball-tampering scandal, in which they were whitewashed 5-0 in the one-day series. England play the first of three T20 internationals against India at Old Trafford on Tuesday. Buttler’s stellar performances across three formats of the game, which began with five successive half-centuries opening the batting in the Indian Premier League, resulted in a push to the top of the order for England. If his match-winning century in the fifth ODI on Sunday was measured, this knock on a run-filled Edgbaston surface was Buttler back to his customary brutal hitting and invention. He opened his shoulders by hitting debutant leg-spinner Mitchell Swepson for a straight six and, in the next over, took 18 runs from four Kane Richardson deliveries. No bowler was safe – left-arm spinner Ashton Agar was heaved over mid-wicket, and paceman Billy Stanlake slapped over the extra cover rope. When Stanlake was scooped for four, Buttler had beaten the 23-ball half-century made by Ravi Bopara against Australia in 2014, and the assault only stopped when he dragged Swepson to D’Arcy Short at deep mid-wicket. On a sun-kissed evening, Australia captain Finch gave away the chance to bat first and saw his team suffer from then on. Previously on this tour, they had been given few reminders of the ball-tampering controversy, but Edgbaston is perhaps the most partisan of England’s home venues. Throughout, Australia endured songs that claimed they are “always cheating”. Nothing, except an impressive spell from the slippery Swepson and Finch’s hitting, went right for the visitors. Richardson’s plight typified their evening. He dropped a simple chance at long-off when Roy was on 27, his 0-59 is the second-most expensive return by an Australia bowler and, later, he was dismissed by the first ball he faced. The reprieved Roy freed his arms at every possible opportunity, Hales mixed power with deft touches and Joe Root recovered from a slow start to make 35. Australia dragged it back late on, but by the time Jonny Bairstow swiped Andrew Tye’s final ball of the innings for six, Edgbaston was singing that football is coming home. 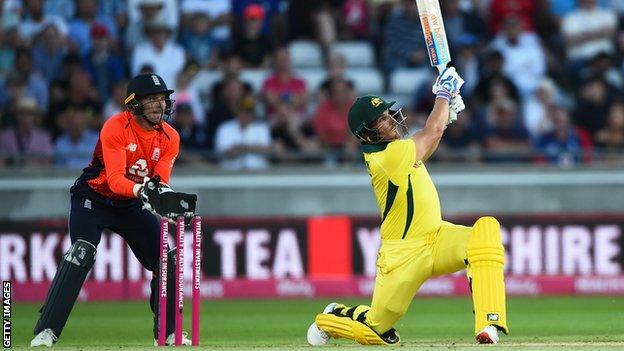 Destructive opener Finch’s 156 at Southampton in 2013 is still the highest score in T20 internationals. Here, he saw his team-mates once again struggle against spin – Rashid and Moeen Ali combined to take three wickets for eight runs in the space of nine balls to reduce Australia to 72-5. By the end of the ninth over, Finch had faced only 19 balls. Australia needed 149 runs. Finch, now with Agar for company, exploded into life. Targeting the leg side, he dished out some devastating treatment to Moeen in particular. The off-spinner’s final two overs cost 41 runs, only six of which were hit by Agar. Still, the required rate did not get below 13 and Finch perished trying to continue the charge, miscuing the dependable leg-spin of Rashid to Chris Jordan at long-on. Australia’s slim hopes departed with their skipper. The Edgbaston crowd, briefly concerned, returned to revelling in Sweet Caroline as the tourists lost their last five wickets for 35 runs.